Image of the "Midland Valley" outcrop taken by the Left Navigation camera onboard NASA's Mars rover Curiosity on Sol 2320. Curiosity returned to science planning today after a two week hiatus because of a technical issue. Our most recent science plan, described in the blog for Sols 2320-2323, included a drive towards a blocky outcrop called "Midland Valley." 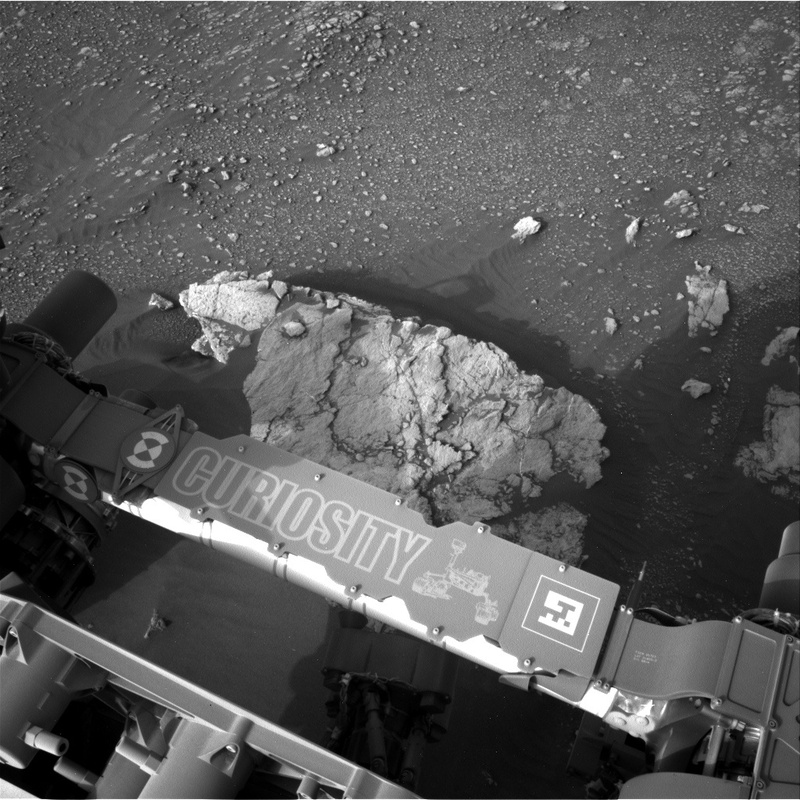 The drive was a success, bringing us right on top of the beautiful chunk of rock shown above - but before we could reach out and touch it, Curiosity went into safe mode. While the engineers worked to return Curiosity to nominal operations, the science team stood down from planning, eagerly awaiting our chance to get a closer look at Midland Valley. Today's plan includes that closer look. With Mastcam, ChemCam, MAHLI and APXS, we'll investigate two spots on the outcrop: "Alloa" and "Auchterarder." Mastcam will also survey our surroundings with mosaics of wind-blown sand features ("Mormond Hill," "Motherwell" and "Mount Keen"), a look back at our previous workspace (towards the previously-explored targets "Curlew" and "Gannet"), a look ahead towards a potential future drive destination (at an area with blocky outcrop called "Milltimber"), and a look up to the sky at the dust in the atmosphere. In addition, ChemCam will use LIBS (the laser) to investigate another rock target called "Crathes." The engineering team is working hard to understand the issue that occurred on sol 2320, and upcoming plans will be dedicated to diagnostic activities. We will update you as we learn more, and in the meantime, the new observations from Midland Valley will keep us scientists busy!